It’s been a while since I wrote an article about tourist visa scams and scammers, but sadly they still exist. There is many an overly trusting Australian who simply wants to be loved and wants a Tourist Visa from Philippines to Australia for his Filipina girlfriend, and the fact is that unless you’re Jamie Packer you simply don’t see yourself as a target. Most Aussies are just like every other Aussie. You might earn a little bit more than your neighbor, but not THAT much more that you have to worry about them preying on you. Even doctors and lawyers in Australia take their own garbage out and mow their own lawns. Well, once you have dealings with the Philippines then all of that changes. Congratulations! You are now a rich man! And don’t get me wrong! I’m not laughing at anyone or judging. My first trip to the Philippines in the 90’s was a result of being lured here by a pretty face and some seriously suggestive flirting from a 23 year old in Biliran Leyte! Interesting times! Common to this scam is the prospective Australian sponsor hasn’t met the Filipina girl in person yet. Anyone from Australia who’s had an immigration assessment for a Tourist Visa applicant from Philippines via Down Under Visa’s free visa assessment form knows that we will strongly try to talk you out of applying for a tourist visa when you haven’t met in person before. If you’ve made a commitment to a relationship by traveling overseas to meet the girl in her own country and her usual surrounds (and most likely met her family too), then a trip to Australia is most likely to enhance your relationship and probably to take the relationship to the next level. She is less likely to be a risk of breaching visa conditions and overstaying. And the Embassy staff know this too! Whereas a brief relationship between a flirtatious Filipina girl and an Australian man she’s never met before, it’s far more of a risk. They know this, and therefore far less likely they would grant the visa. If the visa applicant was from Japan or somewhere with a fairly affluent population, less risk. But Tourist Visa applicants from Philippines, whether applying in Manila or from somewhere in China, they have practically no hope of ever getting a tourist visa under these circumstances. Add-on sales! Just like McDonalds staff saying “Certainly sir! And would you like fries with that?” Every successful scammer wants to milk every drop they can get. So you get additional requirements added on to the visa application. Selling a plane ticket– We always say “Don’t book flights until the visa is granted!” The Australian Embassy in Manila say the same thing. Claiming that the visa applicant needs expensive insurance– I’ve heard stories of compulsory travel insurance of over $1,000.00. Travel insurance and health insurance make good sense, but it won’t cost $1,000.00! 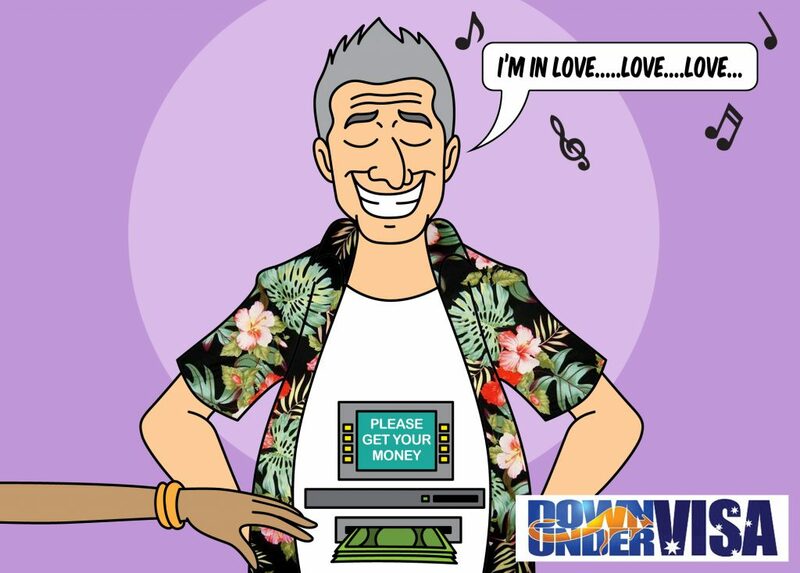 And the old favourite – “Show Money”– This is the ol’ chestnut story of how the visa applicant needs to show that they are independently wealthy, able to support themselves, and therefore no risk of overstaying. The scam is that you need to “loan” her anything from AUD$2,000.00 to AUD$5,000.00 to deposit into a bank account in her name, which will supposedly fool the Case Officer in the Embassy into thinking that she somehow earned this money working in Pure Gold supermarket. Just think about that one WITHOUT thinking about a pretty girl, and what conclusion do you draw?? How can an Australian avoid visa scams from Philippines? The common denominator in any visa scam is money. If the scammer had money and the Australian man had nothing? No scam would exist. In fact if either of those scenarios existed, then the scam would never happen. However no one in Philippines believes that any Australian is ever short of money, so you’re stuck as the rich man. However, there are two types of rich man. Which of the above is more likely to get scammed? Kind of obvious! The other factor is time! If you start chatting away with a girl and you’ve started sending allowances to her within weeks, then don’t expect much sympathy when you get scammed. If your intention is to build a genuine relationship and 6 months into it you haven’t sent a penny? Chances are all but the most determined scammer will have moved on to greener pastures. So take your time and keep money out of it! And try to keep your brain active and alert. Great article. I invested a LOT of time getting to know ladies online before they cut themselves out of the relationship. Definately SPEND time on her before you COMMIT to a long term investment when you could end up being bankrupt in a short term.